Georgie is settling into the Rannoch House when she is summoned once again by Her Majesty. The Crown Prince is still sowing his royal oats, but the queen is determined to find him a suitable wife and possibly an heir to the crown. Her hopes lie in a Bavarian Princess Hannelore (aka Hanni). Hanni's fresh from the convent and HM feels the princess might be more comfortable with Georgie than some stuffy old people. So Hanni and company (Baroness Rottenmeister and Hanni's maid) enters Georgie's home and life, causing a huge uproar with her English learned from gangster movies, shoplifting, and causing a ruckus wherever she goes. Meanwhile, people keep dropping like flies around Georgie and Hanni. First it's Tubby, how was quite plastered and Georgie's positive his death from falling over the balcony was an accident. Then Sidney's stabbed to death in a bookstore. The Baroness dies from what the people say was a heart attack even though she looked very robust. While sneaking around after a communist party rally Georgie finds Mr. Solomon (Sidney's boss) dead. Amid all this, Georgie uncovers a foul plot against the crown. In her personal life, Darcy is acting strange and she's afraid she might have lost him for good. What can I say? 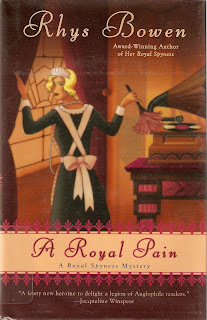 I liked the first book, Her Royal Spyness, and I loved this book. It had mystery, thrills, romance, etc. It's interesting to read what problems Georgie's going to walk into and how she's going to get out of them. Many times the problems Georgie encounters aren't her doing, but she's caught up in the circumstances. Yet, rather than pout and demand things, she bucks up and pushes forward. However, she's not above using subterfuge to get what she needs. All the wonderful characters are back as well. Belinda even helps Georgie out by playing her maid for a while, her father takes on the role of her butler, while his neighbor, Mrs. Huggins, poses as the cook. Darcy's back and there's more delicious development of his character, leaving Georgie and the reader to wonder who he really is. "First it's Tubby, who was quite plastered and Georgie's positive his death from falling over the balcony was an accident. Then Sidney's stabbed to death in a bookstore.". hey, Sidney's death might have been an accident. maybe he inadvertently rolled over onto a knife. eight or nine times. i had a colleague who believed something quite similar to that in a murder case here in Arizona years ago. Just like the guy who fell down the elevator shaft after accidentally falling on six or seven bullets. Did you offer up a bridge over some ocean front property to your colleague? it was a spousal thing, but i'm hazy on the details now. the wife stabbed the husband multiple times as he lay sleeping, or vice versa. my colleague had just gone through a painful divorce. he's a peaceful soul, and apparently he can empathize with someone accused of spousal murder, and who was claiming it was an accident. so we sold him the London Bridge and told him as soon as California fell into the sea, he'd have a bridge as important as the Golden Gate Bridge.